Multiple sclerosis (MS) is one of the most common diseases of the central nervous system – the brain and spinal cord - affecting about one person in every thousand in the USA. It is an inflammatory condition, where the immune system attacks the myelin sheath that surrounds the axons of nerve cells. Myelin is a fatty material that insulates nerves, acting much like the covering of an electric wire and allowing the nerve to transmit its impulses rapidly. It is the speed and efficiency with which these impulses are conducted that permits smooth, rapid and co-ordinated movements to be performed with little conscious effort. Loss of myelin interrupts these impulses, and the nerve cells themselves are also damaged and eventually die. The consequences for people with MS can be devastating, and MS is associated with a wide variety of symptoms, including muscle weakness, spasms, ataxia, problems with speech and vision, acute and chronic pain, and fatigue. 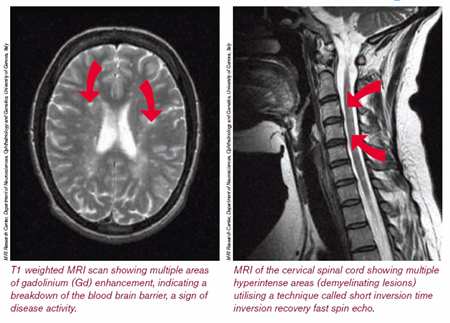 MS is a very variable disorder, and the rate at which it progresses varies considerably from one patient to another, but a defining characteristic of it is the lesions that are visible by MRI where the myelin has come under attack. The relapses, attacks of worsening neurological function that are often found in MS, are closely associated appearance of new lesions in the CNS, although not all new lesions cause a relapse. Until about 20 years ago there were no treatments available that could prevent relapses or slow the progression of MS – known as disease modifying treatments - but thanks to the efforts of scientists working around the word this situation has begun to change. A number of effective disease modifying treatments are now available, the most recent to receive FDA approval is Fingolimod (known as FTY720 during its development), a drug whose immunosuppressant properties in reducing transplant rejection and as a treatment for MS were evaluated in a range of animal models during its development. These drugs may soon be joined by another. 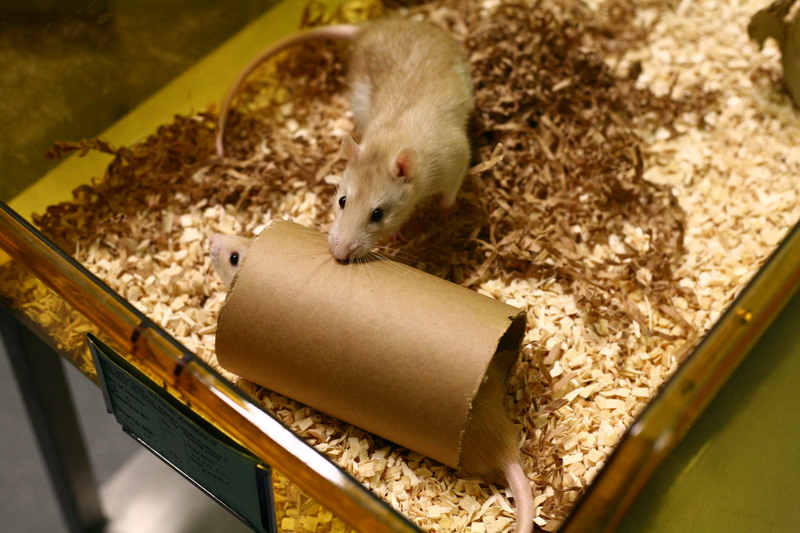 A couple of years ago I wrote about the crucial role of studies in mice, rats, and dogs in the development of a new disease modifying treatment called Laquinimod, and last week the manufacturers of laquinimod announced that it had performed well in a phase III clinical trial, safely reducing the number of relapses and slowing progression of disability. This is excellent news, and one more step towards turning MS form being an incurable disease to being a manageable disease. One reason I say manageable rather than curable is that while these treatments are effective in reducing the number of relapses for many patients they do not work for all patients and all forms of MS (particularly for primary progressive MS), and can sometimes have serious side effects that prevent patients from continuing treatment. That is why scientists are continuing to study the biological mechanisms in MS, a disease whose origin is still not fully understood, though clinical and animal research indicates that both genetic and environmental factors play a role, their ultimate goal is to develop treatments that can stop relapses altogether. Another reason for not referring to disease modifying treatments as “cures” is that they do not directly repair the damaged myelin sheath at the lesions. Spontaneous repair of the damaged myelin sheath in MS lesions does happen and plays an important role in limiting neurological damage, but until now the molecular basis of myelin regeneration by cells called oligodentrocytes, in the central nervous system (CNS) has been poorly understood. The Guardian reports on how scientists at the University of Cambridge have discovered how to promote remyelination in MS lesions by activating a population of stem cells in the CNS called oligodentrocyte precursor cells (1). The team led by Professor Robin Franklin generated a comprehensive transcriptional profile of 22,000 genes during the separate stages of spontaneous remyelination that follow focal toxin-induced demyelination in the rat CNS, and found that the level of retinoid acid receptor RXR-gamma expression was increased during remyelination. Cells of the oligodendrocyte lineage expressed RXR-gamma in rat tissues that were undergoing remyelination, in both active lesions and in older remyelinated lesions. By examining post-mortem brain samples from MS patients, they were able to show that RXR-gamma expression was also elevated in oligodendrocyte precursor cells at the active lesion sites, supporting a general role for RXR-gamma in remyelination. Interesting as these findings were they did not demonstrate that RXR-gamma is actually required for remyelination, so they next performed studies to determine whether blocking the function of RXR-gamma would prevent remyelination. Knockdown of RXR-gamma by RNA interference or RXR-specific antagonists severely inhibited the differentiation of oligodendrocyte precursor cells into mature oligodendrocytes in culture. In mice that lacked RXR-gamma, adult oligodendrocyte precursor cells efficiently repopulated lesions after demyelination, but showed delayed differentiation into mature oligodendrocytes. The next question was whether increasing the activity of RXR-gamma would speed up remyelination. Administration of the RXR agonist 9-cis-retinoic acid to demyelinated mouse cerebellar slice cultures and then to aged rats in vivo after focal demyelination caused an increase in remyelinated axons. Focal toxin-induced demyelination was used to produce the lesions, rather than an immunity mediated model of demyelination such as experimental autoimmune encephalomyelitis, in order to determine that the increased remyelination was due to promotion of oligodendrocyte differentiation rather than to the anti-inflammatory effects of 9-cis retinoic acid. The results indicate that RXR-gamma plays an important role in endogenous oligodendrocyte precursor cell differentiation and remyelination, and might be a pharmacological target for regenerative therapy in MS. The discovery that 9-cis-retinoic acid, a compound already in limited clinical use, can be used to stimulate myelin regeneration raises the possibility that within the next decade treatments that repair the neurological damage in MS will begin to enter clinical trials. For people with MS these scientific and clinical advances are a great source of hope for a better future.